Twice ITU World Champion Helen Jenkins (www.helenjenkins.co.uk) missed all of the 2013 season through injury - and indeed hasn't raced since her fifth place finish at the 2012 Olympic Games. Helen is now back into full training and looking forward to racing once again, with New Zealand in March scheduled for her return to the pontoon. With the progress on Non Stanford and Jodie Stimpson during 2013, Great Britain's women have never looked stronger in ITU racing. We chatted to Helen at the Triathlon Plus Show at ExCeL at the weekend to get the latest on her recovery, plans for the year and clocking up "huge volume" during recent training camps. 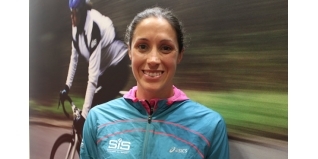 Helen Jenkins is a brand ambassador for nutrition brand Science in Sport (www.scienceinsport.com).